Josh Elliott edged out Alastair Seeley in Sunday's British Superstock 1000c showdown between the Northern Ireland riders at Cadwell Park. Fermanagh man Elliott won by 1.99 seconds from the Carrickfergus rider to stretch his championship lead over Seeley to 22 points. Glenn Irwin was fifth and seventh in the Supersport races with Andy Reid sixth in the opener. Michael Laverty was fifth in the opening Superbike race. 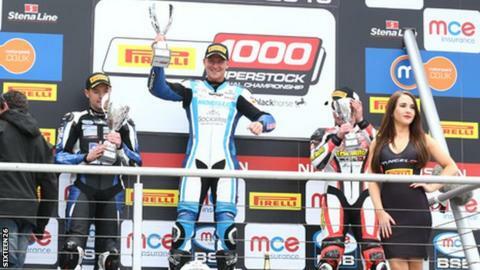 Tyco BMW rider Seeley started on pole for the Superstock event and held an early lead at the Lincolnshire circuit. However, Elliott moved ahead on the third lap on his Morello Racing Kawasaki and stayed in front to take maximum points. Irwin remains third in the Supersport standings but is now 91 points behind leader Luke Stapleford, who won both races. Jordanstown rider Reid, who retired in the second race, is back in sixth place. Toomebridge man Laverty crashed out of the second Superbike race and lies fifth in the series.